South Sudan's President Salva Kiir added impetus to the impending formation of a Transitional Government in Juba next month with a visit to Kampala that signalled a growing optimism that lasting peace could finally come to the world's youngest nation. South Sudan's neighbours--Sudan, Kenya, Uganda and Ethiopia--are pushing to find a lasting solution to the hostilities in Juba, restore security, reduce the refugee burden, and boost trade and investment. "Despite a few challenges, there is progress. I urge all parties to work towards peace and stability," the Ugandan leader tweeted. Pope Francis, who met President Kiir at the Vatican in March, and is believed to have invited him for this coming week's meeting with Dr Machar, has over the past four years kept South Sudan on his agenda. The Catholic Church has promised to contribute towards rebuilding the country's dilapidated education and health sectors as well as support reconstruction in South Sudan. But it wants peace first. Pressure is also coming from the United Nations to have President Kiir and signatories to the September 2018 peace agreement keep to their commitment and ensure a lasting peace, even as the Troika --the UK, the US, and Norway--who financed it remain sceptical. James Morgan, South Sudan's ambassador to the African Union, said the Pope had found it fit to invite the other peace partners, whose endorsement will be vital to the agreement, especially the proposed five vice presidents in the Government of National Unity. James Oryema, Dr Machar's representative in Kenya, said the Pope is using religious leverage to build confidence in the political leaders to implement the peace deal. "This would be the third time Pope Francis will be praying for President Kiir to give peace a chance. In 2015, while in Uganda, Pope Francis prayed for President Kiir to implement the peace agreement but it collapsed," Mr Oryema said. Unlike the 2015 peace agreement, when the region left South Sudan to its own devices after signing the deal, the country's neighbours led by the two guarantors--Presidents Omar al-Bashir of Sudan and Museveni of Uganda--as well as Kenya's Uhuru Kenyatta, are now keener on finding a lasting peace under the September 2018 agreement. "The region is embracing peace as opposed to conflict so that we can fully achieve regional political and economic integration as envisaged in the African Union Agenda 2063. "South Sudan hopes that countries under the Intergovernmental Authority on Development should continue to work together in the interest of our region," said Mr Morgan. The Ugandan government offered to pay the traders and send the bill to the Juba administration--as a loan. But 13 of the 23 companies, whose payment parliament approved in April 2018, have yet to be paid. Juba insists the claims are being verified. Kenya, which has invested heavily in Juba's banking and real estate sectors, is also keen on finding a lasting peace that can facilitate thousands of its citizens to work and do business in South Sudan. Embattled Sudanese President al-Bashir has been pushing for the implementation of the peace deal to boost his country's economy through a resumption of oil production. 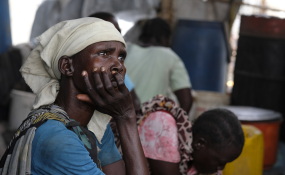 "South Sudan is on its way to becoming an informal protectorate of Sudan and Uganda. By formally acknowledging them as 'guarantors,' the agreement recognises their strategic role in determining the future of South Sudan: Ugandan troops are physically present to support President Kiir's faction, and Sudan provides critical support to opposition groups, including those led by Dr Machar," wrote Prof Mamdani in an article published in the New York Times.